Their food is always the best, the atmosphere never fails to amaze, and the service is impeccable. Lunch with the Ds at Original Mike’s will prove fantastic! The restaurant, at the corner of First and Main was one of Southern California’s earliest car dealerships back in the day – from here were sold Packard, Studebaker, Hupmobile, it was even a Tucker agency! The brick construction is in tact and much of the tiles on the dance floor are original from when the building was a showroom. The inside has been remodeled respectably maintaining the original charm of the building and is decorated with pictures from early Santa Ana, a shark, and often times there are antique cars inside. It’s a great place to enjoy a meal and share the DeLoreans. 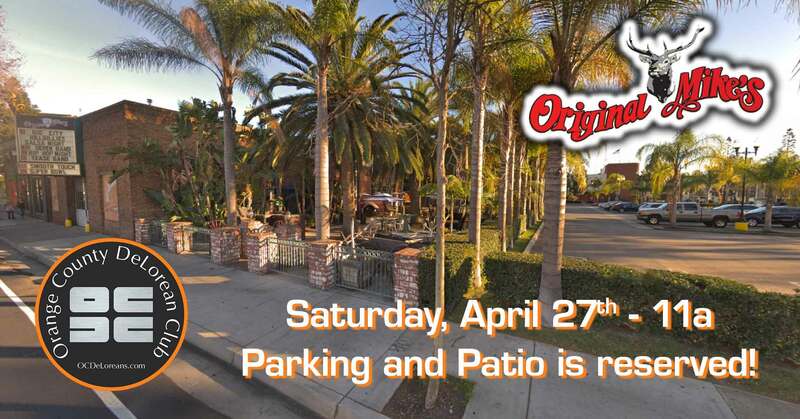 Original Mike’s will set aside special parking for us, and set us up on their beautiful outdoor patio. After lunch, if we want, we can cruise to Balboa or Newport or Laguna or ??? ?